From renting out dumpsters to opening a gourmet food truck, these 7 entrepreneurs launched businesses in Kansas and North Dakota boomtowns. Ever since she worked in a coffee shop during college, Megan Wold had dreamed of opening her own cafe. When the oil boom hit Williston in full force last year, she had her chance. "The boom happened, and I thought, `Now is the time to do something like this if I ever want to do it, because it's so crazy in Williston and the perfect opportunity to start any business,' " said Wold. 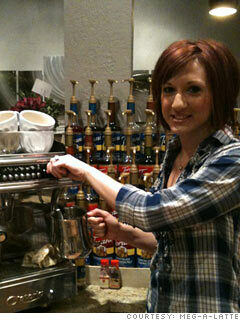 She opened a small coffee shop, Meg-A-Latte, in downtown Williston in February. The café, which sells baked goods and caffeinated drinks like lattes, mochas and chai teas, has dim lighting and a big rock fireplace. The walls are decorated with her husband's artwork. So far, it's been even busier than she anticipated, and she has already had to ramp up her workforce from three employees to seven to keep up. "It's been busy since Day 1," said Wold. "I was planning on working by myself for a lot of the day, but after the first day I realized that wasn't going to work." One of her favorite parts of the job is meeting the new people who come through the door. "I have a variety of customers -- a lot of people who have lived here forever and know me and know my family, and then there are all the new people in town, and of course the people who work in oil," she said. "Every day I meet new people. I'm having the time of my life." Opening up a small business in a tough economy is a gamble. But these ten states saw more startup activity than anywhere else nationwide.